How Would An "Exercise Pill" Actually Work? Couch potato? There might be a pill for that. We’re all aware of the benefits that come from exercising regularly, and while a lot of us enjoy a good run in the park, there are just as many people in the world to which this pleasure is denied, whether it’s because of health conditions, mobility-limitations, or age. Thinking about them, or perhaps about the many couch potatoes out there who would rather swallow a pill than wear their trainers, a group of scientists have developed a commercial drug that mimics the effects of exercise while eliminating the need to run a mile three times a week. Ronald Mark Evans, a biologist at the Salk Institute for Biological Studies in La Jolla, California, used a chemical compound known as GW1516, or 516. 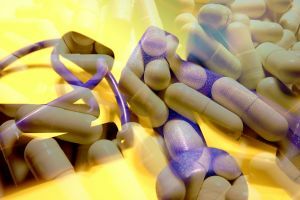 Salk scientists have been working on an “exercise pill” for nearly a decade, and after conducting tests on mice, discovered the compound essentially prevents the body from burning glucose (sugar) for energy, and instead makes it burn fat; this typically takes longer for the body to do, as it prefers to use glucose first, then fat. In a post published last year, Evans and his team explain that the body burns glucose unless it has a good reason not to, such as maintaining brain functionality during “periods of high energy expenditure,” or during workouts. Ali Tavassoli, a professor of chemical biology at Britain’s University of Southampton, has also been exploring a drug known as compound 14 to achieve the same effect as 516. Compound 14 “fools the body” by affecting the functionality of an enzyme called ATIC, which helps regulate the body’s metabolism. Blocking this enzyme triggers a chain reaction that leads the cells’ central energy sensor to think it’s running out of sugar. As a result, the cells speed up their metabolism and their sugar uptake. Its creators believe that if, Compound 14 was successfully tested on humans (after passing the mouse model stage), it could be an effective tool against obesity, which affects more than a third of the U.S.’s adult population. “If you can bring them a small molecule that can convey the benefits of training, you can really help a lot of people,” Evans said. These also have varying side effects, ranging from abdominal pain and headaches, to dizziness, nausea, and more. The aforementioned compounds are far from being cleared for commercial use, though. For one, they’d need approval by the U.S. Food and Drug Administration, but the organization doesn’t see an inability to exercise as a disease that requires treating. Evans is aiming to use compound 516 to treat those suffering from Duchenne muscular dystrophy, a disease that can make it hard for children to walk, run, sit, stand, or do any physical activity that requires them to use their muscles. Evans and Tavassoli are aware that both compounds could be abused by athletes if they’re ever approved and sold for commercial use; the World Anti-Doping Agency has already banned 516 to prevent further abuse. However, Evans believes it’s more important to focus on those who can’t exercise.